If anyone thought that the 1996 Farm Bill was going to be the last farm bill as we knew it, that AMTA payments really would be transitional, and that agriculture would be less dependent upon Washington for its revenue, they are surely disappointed with the Draft Farm Bill Concept Paper that was posted on the U.S. House of Representatives Agriculture Committee website. The goal of committee Chair Larry Combest, R-Texas, is to write a new farm bill to replace the 1996 Farm Bill by the August 3 Congressional recess, a year ahead of its expiration. Instead of transitioning AMTA (remember, the "T" in AMTA stands for the word "transition") payments to zero, the proposed legislation continues them at the 2002 level for the duration of the new legislation. And, with the addition of the new counter-cyclical payments based upon target prices and base acres, agriculture will likely remain dependent upon government payments. As outlined in the concept paper, fixed decoupled (formerly called AMTA) payments will continue with the addition of oilseeds to the list of contract crops. Payment rates for the current contract crops will be set at the 2002 levels. The soybean payment rate will be 34 cents per bushel with a comparable rate for minor oilseeds. Payment limits of $40,000 for the fixed decoupled payments for all crops would continue. The new counter-cyclical payments (LDPs [Loan Deficiency Payments] and MLGs [Marketing Loan Gains] are already counter-cyclical) is like adding a variable AMTA payment to the fixed AMTA payment. The fixed decoupled payment is always paid no matter the market price. The new counter-cyclical payment is only paid if the fixed payment does not cover the difference between the crop's target price and the larger of the market price and loan rate. The counter-cyclical payment institutionalizes income that was supplied by the ad hoc Marketing Loss Payments in recent years, providing a more predictable income flow for producers and their bankers . The target price-based counter-cyclical payments approach borrows from previous legislation but differs from earlier legislation in a couple respects. One key difference is that, unlike previous legislation, eligible farmers receive the counter-cyclical payment whether or not they plant the crop that generates the payment. Another difference is this House proposal specifies the use of a twelve rather than a five month average price when calculating differences between target prices and market prices. Total payments continue to be computed using base acreage and program/AMTA yield information. Under this proposal, producers have the option of using their current AMTA acres or updating their base acres to reflect average acres of their contract crops and oilseeds planted during the 1998-2001 period. Once updated for the 2002 program, the base acres are used for both the fixed decoupled and the new counter-cyclical payments. Payment acres for both programs are 85% of the base acres-it matters not what you actually grow or don't grow. Payment yields for the fixed and counter-cyclical programs use the current AMTA payment yields, which are now at least ten years out of date. If the yields were updated to current levels, as some have advocated, the payments would cover a larger proportion of production, but, of course, would make the program more costly. Increasing payment yields would require cuts of non-commodity agricultural programs to stay within the specified $73.5 billion ten year limit. The proposed target prices are identical to those used in the 1990 Farm Bill (Table 1). In addition, the new soybean target price would be set at $5.76 per bushel with comparable target prices for minor oilseeds. A payment limit of $75,000 for counter-cyclical payments for all crops would be established. Table 1. 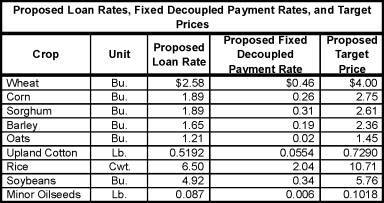 Loan and payment rates and prices as outlined in the Draft Farm Bill Concept Paper proposed by House Agriculture Committee Chair Larry Combest. The current marketing loan provisions which include Loan Deficiency Payments (LDPs) and Marketing Loan Gains (MLGs) would be continued for all crops. Current loan rates would continue for all crops except that soybeans would be set at $4.92 per bushel (34 cents lower than the current level - it would appear that this 34 cents has been shifted to the fixed decoupled [AMTA] payment), minor oilseeds at $0.087 per pound and sorghum at $1.89 per bushel (sorghum producers have argued that, based on feed value, the sorghum payment rate should be the same as corn). Other provisions would include loan eligibility on 100% of current production and a payment limit of $75,000 for LDPs and MLGs for all crops. The government's projected additional cost for the program crops is $48.886 billion over ten years. At the time the 1996 Farm bill was adopted, few believed LDPs and MLGs would be activated over the life of the act. This time around, most ag committee members likely believe that LDPs, MLGs, and perhaps target-price based counter-cyclical payments would be used every one of the next ten years if this proposal became law.